It is National Volunteer Week! As an all-volunteer organization, Phoenix Landing Foundation would not be able to do the work it does for parrots without our numerous volunteers! It isn’t possible to highlight everyone individually, but we decided this would be a wonderful opportunity to help everyone get to know our volunteer Adoption Coordinators a little better. So, for the next few days, we will profile them! We will start with Jenny, our Virginia adoption coordinator! 1. For what area are you the adoption coordinator for Phoenix Landing? 2. How long have you served in this volunteer role? 3. How did you first learn about or get involved with Phoenix Landing? In 2003, I was in a pet store with my grey Henry. She was on a harness, and spent most of the time chewing on it, desperately trying to remove it. (We don’t do harnesses anymore). While checking out, a Phoenix Landing volunteer who happened to work behind the register gave me a newsletter, and I contacted the main email to see how I could help. I was the education coordinator until 2007 – helping to put together the newsletters back when they were a quarterly magazine, and developing classes. I later moved into writing books about behavior, but since 2007 have been the adoption coordinator. 4. There are many causes and non-profits out there to get involved with, why did you choose this one? Easy! Because I love birds and want to help them. This group is focused on the birds: providing optimum care, being good role models, and educating caregivers. I have learned so much from the speakers we’ve had through the years. We’ve had just about every significant voice in the parrot community share their wisdom with us. And of course, Ann [Brooks] makes everyone feel appreciated and welcome. She is the best! 5. What do you like most about volunteering with Phoenix Landing? Making a great match between bird and family. Sometimes it takes a while. I remember placing a grey with a family. The bird loved the dad, but wasn’t too crazy about the rest of the family. After a few months, it was obvious that the placement would not work out. However, I was struck by how kind they were, and how they wanted for the parrot to go to the right home. It was painful for them to give the parrot up, even though he wasn’t the best match for them. A few months later, we received a relinquishing form for a caique. I thought of them, and contacted them out of the blue to see if they would be willing to try again. They were happy to hear from us, and decided to try fostering the bird. It was a perfect match! The entire family interacts with and loves the bird – and when on vacation, they wait for pictures from their bird sitter daily! It was a very happy ending. 6. What else would you like to share about yourself, about volunteering, or about Phoenix Landing? I have a Moluccan cockatoo, a grey, a pionus and a quaker. My web site, jennydrummey.com, has videos, articles and more information about parrot care. We have a great group of volunteers but can always use more! The species we need the most help with fostering are the big birds: macaws, cockatoos,and amazons, and this need continues to grow daily. Anyone who is interested in what it’s like to live with larger birds should consider fostering through us first. You can learn if the commitment necessary for large parrots is one that you can deal with. If you are interested in volunteering with Phoenix Landing, email us at phoenixlanding@earthlink.net. Sometimes, the words “thank you” do not seem to be enough. This is one of those times. In April, 2016, Companion Animal Health donated a Class IV Companion Therapy Laser to Phoenix Landing. The laser will be used to help some of the birds at the adoption center and in the Phoenix Landing program who might benefit from laser therapy. 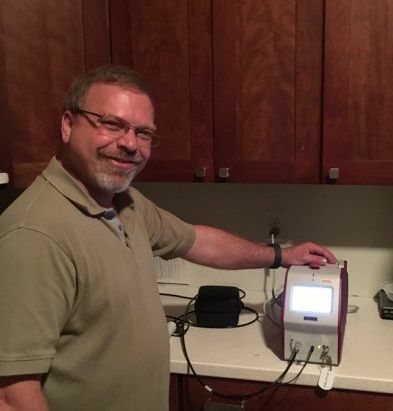 Dr. Robert Ness, DVM, of Ness Exotic Wellness Center in Illinois, presented on the benefits of laser therapy for specific cases at the 2016 Phoenix Landing Wellness Retreat. Dr. Ness gave an overview on the proper use of the laser and safety protocols to Phoenix Landing President, Ann Brooks, and Vice President of Education, Dr. Frank Rutkowski, DVM. Companion Animal Health representative Jennifer Oliverio visited the adoption center in May and provided additional training. Companion Animal Health has also generously donated training from the American Institute of Medical Laser Applications. This training, too, is greatly appreciated! Echo (right) shows his thanks for the laser to Companion Animal Health representative Jennifer Oliverio by giving her a kiss. To add to the literature available on the use of laser therapy with companion parrots, Phoenix Landing will work with veterinarians and participate in several case studies. Dr. Ness identified parrots at the adoption facility who were good candidates for case studies. Information collected will be shared via Phoenix Landing’s website, blog, and Facebook page. So, please be on the lookout for these stories! Phoenix Landing extends a heartfelt thank you to Companion Animal Health for this donation, and to Dr. Robert Ness for his time and guidance. Together, we hope to make the lives of the birds in the program even better! 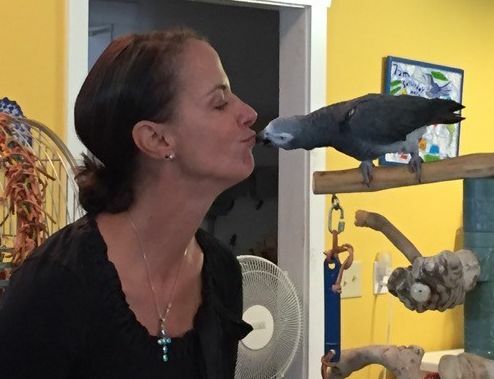 Parrots lost one of their staunchest advocates this week, Wendy Huntbatch, founder of the World Parrot Refuge in Canada. She was relentless in her determination to make a difference; and for hundreds of parrots she has been their provider, ally, joy and savior. Back in the late 90’s, when I was initially inspired to create an organization for parrots, Wendy was the first to respond to my inquiries and offer to help. She was always positive, encouraging and compassionate. She gave much of her time to me freely, sharing her thoughts and all the lessons she had learned. While we ultimately opted to set up an adoption program for parrots instead of creating a sanctuary, she continued to offer ideas, advice and solid moral support up through her final days. In 2002, Wendy joined the Phoenix Landing Board of Directors, and we could always count on her for a lively discussion. Did we agree on everything? Of course not, we are all individuals with our own experiences and ideas. Did she do what she thought was best for parrots? Without a doubt, each and every single time! Wendy introduced me to some of the most devoted, articulate and solicitous people in the world of parrots, such as Dr. Stewart Metz and Rosemary Low. I am so grateful to her for including me in her parrot welfare network, making it possible for us to actually move forward in our own work. I owe her a deep debt of gratitude for her generosity of spirit. Most importantly, Wendy was a fierce and loyal friend, and I can only hope she knew I felt the same for her. Her absence already feels unbearable – but her spirit, her dedication and her unwavering passion will burn in my heart and work with parrots each and every day. I was immensely proud to be invited to be a guest speaker (along with Rosemary Low) to the opening of the new facility — I must say that she employed many excellent features such as flight between whole trees, enrichment, even the ability for some parrots to walk through a hole and go outside for a (safe) short walk -and the birds looked great. Oh, the look on Wendy’s face when she showed off her birds to visitors! Few knew that Wendy suffered from TWO terrible, debilitating illnesses but she never let them stop her crusade to help needy parrots–yes, she was a Crusader and a Lovely Lady at the same time. Will we miss her — YES, very much. Will the parrots miss her — more than they can ever know. I first met Wendy in 1997. In 2000, on a trip to Costa Rica with her and her husband Horst, I got to know her well and to understand her drive and passion for parrots. I visited her in Canada on three occasions, each time being amazed at her parrot rescue initiatives. Wendy died on February 3 after a long battle against cancer and a debilitating lung disease. She was the most remarkable person, totally dedicated to parrots. She lived to give a good life to as many as possible after they had been abandoned by their owners. To see her working with these birds, in the huge aviaries Horst had built for them, was an inspiration. Her strength and bravery during the past five years while tolerating very serious illnesses and treatments were heroic. Her fund-raising efforts to keep the sanctuary running were extraordinary.